home, or belongings. Moreover, they can carry and transmit diseases, parasites, and bacteria to your family or your pets. Just like rats, these animals can invade your home, outbuildings, and attic, and require professional help to remove them. There are two primary reasons squirrels are drawn to your home. Squirrels are affected by weather conditions like the cold in winter, and they seek to protect themselves by finding a warm shelter. As a result, they end up in our homes where they can find favorable living conditions and access to food and water. In the search for food, squirrels become attracted to properties with nuts and seeds. 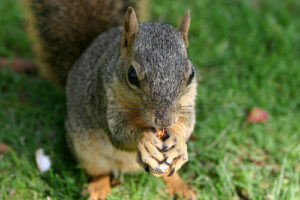 If your property has a plethora of food, squirrels eventually find your home to be an appropriate place to settle down. Most states consider squirrels as game animals. Therefore, you may be required to procure a special permit to trap or remove them. Additionally, even if squirrels are not particularly aggressive, trying to handle them without proper knowledge or assistance can be considered an act of provocation, causing them to respond in an aggressive manner. Professionals understand how to handle these animals and avoid unnecessary bites and scratches. At Critter Control of Southwest Florida, we maintain the required permits to trap and remove squirrels from your home or business, meaning you don’t have to. In addition, our specialists are skilled and knowledgeable on how to handle and remove wildlife humanely from your property, keeping both you and the critters safe. Call us today at 239-872-3355 to schedule a free inspection and speak to one of our squirrel removal experts!